20% discount for ages 65+ on weekday courses! 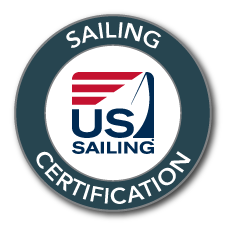 Our 3:1 student to instructor ratio, beautiful location and great boats are just a few reasons to sail with us. With a dedicated staff of people-oriented, professional sailors, we welcome the opportunity to show you just how much fun you can have sailing. Give us a call (703) 768-0018 and we would be delighted to answer your questions. Why do I love sailing! Three students hear a review of their docking. Not exactly our Learn to Sail Course, but fun to watch!